Early 1965's The Beach Boys Today! album - aptly titled, as if to consciously set it apart from what had come before - marked a real turning point in the career of the group. It proved to be the opening salvo in a triumvirate of longplayers (excluding the Party! LP) that defined their status as premier pop artists on a level with The Beatles. Brian's creative drive was fueled by what he described at the time as "the urge to overcome an inferiority feeling" - coupled with the competitive spirit instilled in him by Murry, and hightened by a desire to surpass both The Beatles and Phil Spector. A few of the cuts had been completed in the summer and fall of '64, but the bulk of the album was recorded in the winter months following Brian's retirement from the road. At the age of 22, Brian's composing skills had progressed beyond garage band "formula" writing, into the realm of what one might call "orchestrated rock". This was also the album where the scope and sheer musicality of Brian's arrangements necessitated the employment of outside musicians to a greater extent. As Carl put it in a 1981 interview for "Circus" magazine (reprinted in the September 1989 issue of "Guitar for the Practicing Musician"), "By the time of Beach Boys Today!, there were a lot of prominent session men on the dates." Having said that, one should not sell short Carl's own contributions: the youngest Wilson (who just turned eighteen that December) had developed as a musician sufficiently to play alongside the horde of high-dollar session pros that big brother was now bringing into the studio. Carl's guitar playing on this album is a key ingredient, and in fact this is the most "guitar heavy" of the Boys' post-surf era albums. In a really cool stroke of programming genius, the album is divided into one side of rockers and one side of ballads (a technique probably inspired by two 1961 albums: the Everly Brothers’ Both Sides of an Evening and Elvis’ Something for Everybody, and one later utilized by The Rolling Stones on their 1981 Tattoo You album - but one which has lost much of its impact in today's CD, download, and streaming-oriented world). As for the six songs recorded entirely after Brian's infamous December 1964 nervous breakdown, it's unknown if any of them were freshly composed or had been in development previously (two were, in fact, cover versions of other artists' songs), but certainly Brian's concentration and presence of mind was improved by his abandonment of touring - to the betterment of the music. PRODUCTION NOTE: the standard method of operation for this album was to record the instrumental backing to two tracks of the 3-track tape (either one basic track and one overdub, or two tracks of the basic in stereo), leaving the remaining track for the first vocal overdub. These three tracks were then transferred to a second tape, while simultaneously adding another layer of vocals on top of the first layer (in other words, the resulting "second generation" 3-track tape would feature two tracks of instrumentation and one track of doubled vocals...prior to 1964, Beach Boys recordings would typically contain one track of instruments and two tracks of vocals). There were a few cases where a more elaborate production scheme was followed, and those are detailed below. 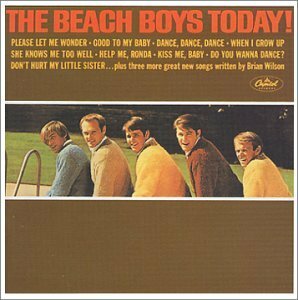 This was also the first Beach Boys album since Surfin' Safari in 1962 to be issued only in mono - evidence of Brian's desire to control every aspect of the listening experience. RELEASE DATE NOTE: although most sources give the album's release date as March 8th, the liner notes in the Capitol twofer CD booklet give March 1st as the official release date. Electric/acoustic rhythm guitar: Bill Pitman ? Electric baritone rhythm guitar: Tommy Tedesco ? Brian returned to his idol Phil Spector's home base of Gold Star Studio A to produce the backing track for this Beach Boys cover of the Bobby Freeman classic. From aural evidence revealed on the session tape (heard on Tracks 1-2 of the above-mentioned U.M. Vol. 8 disc), we can conclude that the group of ten sessionmen named on the AFM contract were accompanied by Brian on piano and Carl on rhythm guitar. Carl is playing through an amp here, as opposed to the direct-to-console method he had begun to employ at Western around this time; his amp was overdriven to produce a distorted tone similar to the one he achived on "Little Honda". The AFM contract for this date lists Larry Knechtel (bass) and Billy Strange (guitar) as being paid $101.68 (the sum of the union scale wage of $81.34 - standard for a three-hour minimum session - plus an additional $20.34 as time-and-a-half for a half-hour of overtime work). Hal Blaine (drums, official union session leader) and Steve "Douglas" Kreisman (sax, session contractor) were paid at a wage of $203.36 each (including overtime), while Julius Wechter (tymps-tambourine) was paid $113.88 (for union scale, overtime, and one "double"). Additionally, five sessionmen were paid the regular $81.34 union wage: Bill Pitman (guitar), Tommy Tedesco (guitar), Jay Migliori (sax), Plas Johnson (sax), and Leon "Russell" Bridges (organ). Multi-instrumentalist Knechtel, performing here on bass guitar, normally played keyboards on Beach Boys sessions; in years to come, he would become quite well-known for for his famous piano accompaniment on Simon and Garfunkel's "Bridge Over Troubled Water", and also as a member of the soft-rock group Bread. Examining the guitar parts, it seems that the spikey electric mandolin lines in the choruses are performed by Billy Strange, as that mandolin part is also doubled on the overdub, and Strange is the only one of the session's guitarists paid for an extra half-hour of work. Some incidental strumming heard between Takes 2 and 3 on the session tape is indicitive of an electric baritone guitar (most likely a Danelectro longscale, set up with 14-68 gauge strings and tuned anywhere from a third to a fifth below concert pitch). Whether this instrument is played by Pitman or Tedesco is not known, but one element of this track is a subtle "acoustic" texture, which could be derived from Bill Pitman's primary studio instrument of the time, a Gibson ES-335 semi-hollowbody (in which case it would be Tedesco who plays the baritone guitar). Regardless, the diverse guitar section on this production contributes greatly to the rocking wall-of-sound production Brian was able to achieve. The basic track was recorded in mono onto the "left" track of the 3-track tape, with special attention paid to the balancing of Hal Blaine's drums and Julius Wechter's explosive tympanis. The perfect take was achieved in just three attempts (the second of which was a breakdown); after this, an overdub was added to the "right" track (heard on Track 4 of the ​U.M. bootleg). This overdub (referred to on the track sheet as "sel-sync", for "selective syncronization") enters on the second verse, and consists of Wechter adding tambourine, Strange doubling his electric mandolin fills, and Knechtel doubling his syncopated bass line in a particularly aggressive fashion (all in the choruses), while Blaine adds heavily-echoed wooden claves, Douglas provides additional sax as a subtle backdrop, and Carl adds a stabbing, overdriven rhythm guitar part. NOTE: despite the claim made in Mark Cunningham's book "Good Vibrations: A History Of Record Production" that "Do You Wanna Dance?" was Brian's first 4-track recording (with the tympanis allocated to their own discrete track), we now know this is not the case. All existing session documentation points to this being a 3-track production; furthermore, a few years back this author reached out to former Gold Star engineers Stan Ross and Larry Levine (both now deceased), who established the date that Gold Star acquired their first 4-track as "early 1966". This aligns perfectly with documentation from other sessions, from which we can determine that The Beach Boys' first use of a 4-track machine was on "The Little Girl I Once Knew" (cut at Western in mid-October '65), and their first Gold Star 4-track recording was the second tracking session for "Good Vibrations" (April 9, 1966). NOTE: as many of us tend to do in the first month of a new year, engineer Levine accidentally inscribed the track sheet for "Do You Wanna Dance?" with the previous year, so that the date reads "1/11/64" instead of the actual date of "1/11/65". Back at Western, Dennis' lead vocal and the others' background vocals were recorded, all at the same time, onto the remaining "center" track of the 3-track tape (with Brian's wife of one month, Marilyn, joining in on a high part). The U.M. bootleg presents the final take of the first of the two vocal layers recorded at Western (appearing on the U.M. disc out-of-sequence as Track 3), in stereo, along with the original basic instrumental track from Gold Star. During this master take performance, Dennis can be heard jumping in too soon for a chorus, but Brian quickly interjects, "It's OK, we can cut it out", sparing the group from having to take it again from the top. Carl also adds another guitar part during this vocal overdub, doubling the rhythmic piano fills between verses, as well as making his first attempt at the solo, which was later mixed out in place of a far better solo (see below). Following the completion of this first vocal track Brian is heard saying, "Let's do an overdub! ", apparently in reference to doubling the vocals. This second layer of vocals was added simultaneously during the transfer to a second-generation tape, sharing a track on the new tape with the first layer of vocals (the basic track and the overdub from Gold Star remained on their own discrete tracks through both generations of 3-track tape). To hear that vocal overdub, we must go to Spank's Capitol Punishment bootleg, which features a mono dub of a different section of session tape, which had been in circulation among collectors since at least the early '80s (a good description of this tape by Brad Elliott can be found in the Summer 1982 issue of the "Add Some Music" fanzine). Rather than rewind the second-generation tape and record over any failed attempts, engineer Britz merely keeps that second tape rolling, allowing us to hear all takes of the tape transfer/vocal doubling. On this session tape, we hear Chuck slate the first take of the vocal double as "1A", which means he would have considered the first vocal layer to be simply the "first overdub", treating the earlier Gold Star instrumental overdub as merely part of the basic tape, since that is how it came to him. We can also hear that Murry Wilson was on hand to coach the group members through their performance from his vantage point next to Chuck in the control booth ("Concentrate now, Dennis...right on the sync."). Once the tape is queued up, we hear a group discussion, possibly stemming from one of the guys asking who had played the mandolin on the basic track ("Strings? !...oh, he said, 'Strange'! "), which actually survives from the start of the first vocal track. We hear Dennis and the rest of the group (minus Marilyn, who is now sitting in the control booth with Murry and Chuck) doubling their vocals, but the instrumental track has been muted from the feed that goes to the session tape mix. This first attempt quickly breaks down, and Mike begins singing an obscene ad lib as Marilyn giggles from the booth and Chuck calls for "2A". Mike's "humor" prompts Brian to make a request of Marilyn: "Y'know, honey, do the 'Chuck Name-Game' once, see how dirty it turns out...it's terrible", while Dennis can be heard distantly in the background doing just that. Murry coaches Brian on his pickup before the chorus, instructing him to "make it a little louder...you're missing that first letter, that first word...", which, as Marilyn points out, is "Ah". Take "2A" is then presented, with both the basic instrumental and the instrumental overdub tracks accompanying the vocals. When this take is finished, Murry is heard asking, "Did you make it?" Following this, the tape concludes with a remix of the same take, this time with the instrumental tracks mixed out until the guitar solo, then mixed out again immediately afterward. This session tape remix allows us to hear the sheer force of the group's powerful vocal performance in all its glory, in a nearly a cappella fashion. NOTE: the liner notes to the Spank bootleg mistakenly list three vocal double takes, but there were only two, plus the mostly a cappella remix of the second take. Before this production could be considered a "wrap", there was the little matter of the guitar solo to contend with; Carl's first attempt at this - recorded at the same time as the first vocal layer - was kinda lame, and he also neglected to add the rhythmic guitar fill in one spot (immediately after the solo). These two parts couldn't be done as a punch-in onto the vocal track (since they overlap slightly with the vocals), so the solution was to have Carl perform them during the final mixdown to the 1/4" mono master tape. During this simultaneous mixdown and guitar solo performance, the vocal track containing the botched solo was faded out, then faded back in at the end of the new solo to reinstate the vocal double. A very dynamic production, with an explosion of sound in the choruses, and Dennis' only hit lead vocal (Number 12 on Billboard's U.S. singles chart). Performed live fairly consistently throughout '65 and '66, in later years it would return to the band's live set with a lead vocal by Bruce Johnston, and also become a regular addition on Brian's solo tours. Beginning in about 2014, the Mike and Bruce band took to incorporating Dennis' pre-recorded lead vocal with their performances of this song - a fitting tribute. Two days after the "Do You Wanna Dance?" basic tracking session at Gold Star, Brian cut the instrumental track for this rocking Memphis-style number at Western. This time, the AFM contract has Billy Strange designated as official union session leader, with Steve Douglas again listed as contractor. On the session tape, we hear that Brian is initially in the control booth, but beginning with Take 6, he joins the band on the studio floor to play piano. Although not listed on the AFM sheet, Carl is again most definitely playing the session, this time from the control booth with his guitar plugged directly into the console. Since the four-bar introduction to this song is nearly all vocal, some thought had to go into the arrangement that the studio band would play: following the count-in, there is silence for the first bar; then Julius Wechter comes in on the second bar, tapping out the beat on his congas; Carol Kaye's Fender bass sounds a single note at the start of Bar Three; Bar Four is ushered in with a strummed chord on electric guitar, after which a single lead guitar plays the main riff once before being joined in unison by a second lead guitar. However, the session tape reveals that it took a few takes to arrive at this final arrangement: both lead guitars initially play the intro riff in unsion the first time through, and the strummed guitar chord (played by Carl) is added to the intro beginning with Takes 3 and 4 (which both break down immediately following that chord). The intro leads are staggered beginning with Take 5, with Billy Strange's darker-toned guitar starting the riff, joined the second time around by Carl's brighter guitar. The basic track is recorded in stereo: guitars, bass, percussion and pianos together on one track, the sax section and echo from the guitars on another. Don Randi is credited with both piano and organ on the AFM sheet, and from what little aural evidence there is of his contribution on the session tape, it seems he plays tack piano on the verses and organ on the choruses. Although Brian joins in on grand piano beginning with Take 6, keyboards definitely take a back seat on this guitar-driven rocker: in fact, it's possible that the pianos and organ are not individually mic'd, their sound instead being picked up distantly by the other mics in the room. Over the talk-back from the control booth, Brian announces Take 1 in a humorous mock-Memphis accent. That take quickly breaks down, but Take 2 progresses fairly well, until Brian stops things to give some instruction to the percussion section (which includes Carl's high school buddy - and Beach Boys roadie - Ron Swallow on tambourine). Between takes, Carl fools around with some Memphis-style licks reminiscent of The Beatles' "I'll Cry Instead" and the Stones' version of "Time Is On My Side". Following Take 4, one of the session musicians (probably Don Randi) seemingly comments, "It sounds like a tunnel goin' on! ", in an apparent reference to the combination of instruments and natural reverberation swirling around the room (although it actually sounds like he says "funnel" rather than "tunnel"). After that take, Brian says, "Now, for those eight bars that are blank...", but the tape cuts off before we can hear the rest of what he says - however, it is at this very point that Brian would have instructed Billy Strange and Carl to stagger their entrances on the main guitar riff. Things really start to cook beginning with Take 5; following this take, Brian moves down to the studio floor to man the grand piano, while Chuck calls out the remaining takes from the control room. Since Hal is having some difficulty in achieving the right tempo for the song, Brian begins doing the count-in along with him. After Take 6 collapses, Brian accuses Carl of missing his cue; Carl responds with, "I hit it", and one of the musicians (possibly Hal) jokes, "Just goes to show you how wrong you can be, right Brian? ", which is followed by general laughter and a humorous musical acknowledgement by Don Randi on the tack piano prior to Take 7 (this is at 0:56 of Track 11 on the SOT U.M. Vol. 8, Disc Two - contrast that with the piano heard around 4:00 on the same track, and the differences between the two can be heard). Take 8 is stopped, and Carl demands to know, "How come he's louder than I am then?!" At Carl's behest, Brian then requests that Billy Strange lighten-up on his lead. Carl stops Take 9 due to a bad bass note; one of the male musicians jokes, "Don't look so serious while you're trying to get away with it", and Carol Kaye can be heard laughing in response. Take 12 starts way too fast, and Brian demonstrates on the piano how he wants the lead guitars to slide up into the half-steps. As take 13 breaks down, Brian asks one of the musicians if they "f***ed up", then apparently felt bad for swearing (aside from Carl and Ron, all of the players were at least a few years older than Brian, and he probably wouldn't ordinarily swear in their presence). Brian's apparent embarrassment causes more laughter from the studio floor, and one of the musicians (probably Billy Strange, judging by the accent) jokingly says, "No, Brian!" (as in "Us? Of course not!"). At the end of Take 17, Brian bangs his piano discordantly to signal the take's end. Take 17 is the last one represented on U.M., but the master take is Take 19, onto which the Boys' vocals were later overdubbed; interestingly, Capitol's Hawthorne, California release pastes the warmup and slate (featuring Brian and Hal counting in unison) from Take 17 onto the top of Take 19's instrumental track. It must be said what cool licks the guitars are playing here, not only in the main verse riff, but also in the second half of the verse into the chorus, where Billy Strange plays a really neat muted part in unison with Carol Kaye's bass, while Carl joins Bill Pitman on the fast rhythm part. Most people would change the guitar part from verse to chorus, but Brian changes it halfway through the verse, then leaves it that way for the first half of the chorus...sheer genius! Also of note is the fact that Tommy Tedesco is evidently playing an auto harp, rather than a guitar - strumming with, and cross-strumming against, the rhythm guitars - adding even more color and texural contrast in that range (the auto-harp can briefly be heard by itself prior to Take 11...at the 3:22 mark on Track 11 of the corresponding SOT U.M. Vol. 8, Disc Two). Having completed this backing track in the early evening hours, Brian apparently returned later that night for a second session, with more-or-less the same group of players (plus Leon Russell, minus Ron Swallow, and once again including Tommy Tedesco on auto harp), and laid down the track for the ballady "In The Back Of My Mind". Since the band track was recorded in stereo, The Beach Boys again had just one track to add vocals (done at a session six days later), before once again doing a tape transfer to a second 3-track tape, simultaneously doubling their vocals in the process. During the first vocal overdub, Carl also contributes some extra guitar, playing the chimey fills prior to each chorus. The U.M. bootleg presents all four takes of the group's attempt to double the already-recorded first layer of vocals during the transfer to a second-generation tape. The first take of this vocal double-track ("1a") starts with Dennis saying, "I wanna do my thing now...or whenever"; to which either Brian or Carl replies, "Can I make a suggestion? Do it after Mike's thing, relax now" (this discussion could relate to the part that Dennis sings on this song, which consists of a lyric different than what the others are singing, and which comes in at a point later than Mike's introductory bass line...OR it could relate to the recording of Dennis' vocal on "In The Back Of My Mind", which, according to Capitol's notations in its CD twofer reissue, was recorded the same day). Takes 1a and 2a both dissolve in the intro due to someone not syncing right with the original vocal, but the third take is complete - just apparently not perfect. The fourth take is the clincher, although the double-tracking is still a bit off in places - nonetheless, it was deemed sufficient, and the recording was complete, subject to mixdown. In the circular five-part vocal round, Mike starts things off, singing the line solo in his great bass voice, followed by Brian up high (with Al and Dennis on harmony), then Carl, supported by the others on "ooh"s, and finally Mike again, this time with "ooh"s. Throughout the chorus, Dennis sings an undecipherable lyric (different from what the others are singing) in his rich baritone. One of Brian's most stunningly complex vocal arrangements, yet one of his most overlooked, demonstrating that even a "filler" tune was receiving great care and attention at this point. Beginning in the mid-2000's, "Good To My Baby" has frequently shown up in the setlists of both Brian's band and the touring Beach Boys. NOTE: in his 1992 interview with Ken Sharp, Mike mentioned this song as being one for which he wrote all the lyrics, hence the above songwriting credit. “Don’t Hurt My Little Sister” is a song with an interesting and confusing history. According to Timothy White, "The title echoed advice that Diane Rovell had repeatedly been giving Brian regarding Marilyn", although others claim the idea stemmed from Brian's feelings of protectiveness toward the third Rovell sister, Barbara. In his 1991 autobiography “Wouldn’t It Be Nice”, Brian recalls that he’d sent a demo of the song to Phil Spector, in hopes that Spector would produce a version for singer Darlene Love; in his 2016 memoir “I Am Brian Wilson”, he states that he had intended the song for another of Spector’s acts, The Ronettes. In the ’91 bio, Brian remembers that a few weeks later, Phil called him at Western, asking that he meet him that night at Phil’s Chateau Marmont hotel room to further work on the song. Brian remembers this as being early May of ’64. In a 1999 interview with Steve Escobar, Brian recounted this songwriting session with Spector: “He called me up and asked me to come to his hotel. And I went there and we started writing, and he said, ‘Play in the key of A. Play “Don’t Hurt My Sister”’, and he wrote a new lyric to it.” Spector then held a tracking session at Gold Star, with Brian in attendance. According to Spector's arranger Jack Nitzsche, Leon Russell was too drunk to play the piano, so Spector ordered Brian to take over at the ivories. Brian has elaborated that he was so nervous at the prospect of playing under the scrutiny of his producer idol that he choked it, and was ordered back to the sidelines by a disgusted Spector after one take (although in his 2016 memoir, Brian describes this incident as occurring the previous year, at the tracking session for a version of "Santa Claus Is Coming To Town", destined for The Crystals and included on the Spector-produced LP A Christmas Gift For You​). Various sources reveal that the Spector-produced track for "Little Sister" was indeed overdubbed with a vocal lead by Darlene Love (again, with Brian in attendance), but never released. The first indication the general public had of this Spector/Wilson collaboration, or of Darlene Love recording a Brian Wilson song, was in the September 1965 issue of "Hit Parader". Brian’s comments in this article derived from a conversation the writer had with the Boys following their appearance at the Academy of Music in New York City on February 13th of that year (about two weeks before the appearance of the song on Beach Boys Today!, but close to a year after the reported date of Brian’s and Phil’s hotel room meeting): “Brian later mentioned that he’s been producing records with Phil Spector…’Phil and I work great together. I did a figuration and he flipped…And I just did a session with Darlene Love. I wrote the song for her too…’” Brian’s comments from February of ’65 would seem to indicate that the Darlene Love vocal session, at least, had happened fairly recently. So, whether the Brian-Spector collaboration actually occurred in May of ’64, after which several months elapsed before Ms. Love’s vocal was added (by which point Brian decided to include a version of the song on the next Beach Boys album), or at what point Mike’s contributions to the song’s lyrics were made (pre-Spector, post-Spector, or perhaps even as late as January of ’65 - see “NOTE” below) is unclear. Regardless of the exact chronology, we can be sure of this much: Brian headed into the studio with his brothers, Al Jardine, and a handful of session players to cut his own version of the song for The Beach Boys on June 22nd of ’64 - two days after his twenty-second birthday - after which the track sat in the can for nine months before seeing release. The tape from the tracking session, as preserved on U.M. Vol. 7, begins with Brian's voice speaking from the control room: "I'll be out there playin' the pe-a-no, maybe...the pie-an-ee player...right...All the way, let's make it tight…” The names of all the musicians (including the four Beach Boys present) are listed on the AFM contract, and the session tape reveals that Carl plays from the booth (his guitar plugged directly into the console), Al plays Fender bass, Ray Pohlman is on 6-string Dano bass, and Hal Blaine (who also served as AFM contractor for the session) plays drums, while Dennis contributes tambourine - at least beginning with the second take. Brian’s comment prior to the first take (“Hal, you wanna get closer to that little thing? 'Cause we're leakin' from anybody else (sic)") would make more sense if Hal was playing the tambourine at that point. Regardless, by the second take, Hal is definitely drumming and Dennis is definitely playing tambourine. With Tommy Tedesco playing rhythm, Carl switching from lead to rhythm on the verses, and with the volume from the rhythm guitars leaking into the other microphones, a full, wide rhythm guitar sound is achieved, even in mono. The first take is really just a dry run, with Brian still in the control booth, establishing the tempo and providing the count-in over the talk-back. Although Brian does leave the booth to join the band at a certain point, it is obvious from this first run-through that there is another pianist playing on the session. Although some sources have identified the "John W. Gray" listed on the AFM contract as a guitarist, it is reasonably clear from the session tape that he is playing piano, at least on this date (it is entirely possible that Gray was a "double hitter" as it were, with talents similar to those of Larry Knechtel, who could be called upon to play either keyboards or bass on a session; the AFM sheet for this session only lists the players' names, not their instruments). Gray's piano can best be heard playing a single-note figure behind the main guitar riff. As "Take 1" falls apart, Brian asks Hal if he knows what happens in a certain spot. Prior to the second take, John Gray runs through the basic chord progression on the piano with one hand, apparently at the request of Hal, who asks John to give him a nod at a certain point in the song to signal him. Meanwhile, Dennis rattles the tambourine impatiently. Before they start up again, Brian issues a series of instructions: "Hal, let's get the tempo...On your hand please, Dennis...let's stay in the same spot so you don't shift around volume...Everybody just play the guitar straight...everybody coincide...Here we go." Although tighter, that second take is still fairly loose, and breaks down at the point where the song modulates upward (Brian, over the talk-back: “Remember, that goes to a “D” there, right?”). Prior to Take 3, Hal auditions variations of the drum pattern for Brian, who is now on the studio floor counting in the band and adding the second piano part, apparently on an upright. Prior to Take 4, Pohlman, Jardine and Gray take turns playing the main theme on their instruments. This take quickly breaks down, and Brian asks Chuck if the high piano part (the one played by Gray) is sticking out too much (Chuck replies that it “Sounds ‘bout right”); after calling out "Take 5", though, Chuck concedes that it is “Just a little bit sticking out”, then calls "Take 6" (which implies that Take 5, however short, is missing from the bootlegger's presentation – either that, or Chuck skipped a take numerically). Take 6 suffers a similar fate as Take 4, breaking down after John Gray plays an incorrect chord. Prior to Take 7, Brian plays through the basic chord progression by himself (asking Al to join him at one point) as a demonstration to the other players, who soon join him in a really loose jam. Chuck doesn't consider this a valid take, however, and resumes his counting with "Take 7". When this take collapses, there is some discussion on the studio floor before Chuck (who was by now the veteran of many lengthy Jan & Dean sessions, and who probably had a bowling league night to get to) comes over the talk-back and humorously chides Brian with, "C'mon Jan, don't make it a long session! Take 8", soon followed by "Take 8, Jan!". Take 8 fades out, and take 9 is omitted. The U.M. presentation resumes with Take 10, which is much more solid than the previous takes, although the tempo does seem to drag a bit. Following this take, Chuck says, “OK, one more real quick, that sounded a lot, much better…One more real quick, Brian.” Still, there follows a discussion amongst Chuck, Carl, and Brian, in which Chuck states, “Carl says it’s a little slow…Brian? Is it a little slow?”, with which Brian disagrees (“No, I like it like that”). Interestingly, Hal is heard saying “Murry, Murry” – seemingly remembering how, on previous sessions such as the one for “Fun, Fun, Fun”, Murry would try to convince Brian that his tempo was too slow. Regardless, beginning with the next take, they do indeed pick up the pace a bit, following another brief jam. Chuck stops that take (Take 11) after the intro, and Take 12 also breaks down very early on. Take 13 is complete, but still a little sloppy. After the swift breakdown of Take 14, the band plays a quick, bluesy rendition of the progression before moving on to Take 15 (which ends almost as quickly as Take 14, as Chuck stops the band). Take 16 is similarly ill-fated, but Take 17 is complete and almost perfect. One more take was deemed necessary, and that became the master; this last take is preceded by Brian’s instruction, “No, basic – let’s go all the way”, followed by his count-in (this sounds like a possible response to someone’s questioning if they were merely redoing a part of the track, to be edited into the previous take as a “pick-up” or “inter-cut”). Following this - the successful achievement of a master take - Carl doubled the lead guitar part on an overdub; a stereo mix of Take 18's basic instrumental track plus that guitar overdub is presented next on the U.M. bootleg (Track 16). Next, we have the first vocal overdub, recorded in an unknown number of takes onto the one remaining track of the original 3-track master (heard on U.M. Track 17), and finally the tape transfer to a second 3-track tape with a simultaneous doubling of the vocals ("1a"), which was fed along with the first layer of vocals into a single track of the new tape; the instrumental backing and guitar overdub were kept in stereo on the two remaining tracks. Prior to the first vocal overdub, Mike can be heard bragging, "Is there anybody in the business...ANYbody better?" Brian and Mike continue chatting as the instrumental track is queued up, and although Dennis tries to stop them by shouting "Go! ", their conversation continues into the guitar intro. In a similar vein, Brian is heard asking "OK? OK so far? ", during the instrumental interlude. All of these spoken voices remain in the final mono mix and can be heard on the album to this day. Likewise, some additional Mike, Brian and Dennis chatter prior to the vocal double – although edited off of the final mix - can still be heard on the U.M. bootleg. NOTE: in his book, author Keith Badman indicates that evidence exists of some work being done on this track on January 18th of 1965; if true, this would most likely be either the vocal overdubs, the final mixdown, or both. FOLLOW UP NOTE: at some point in 1965, Phil Spector was approached by the Advertising Council with the idea to contribute a song as a public service announcement for equal opportunity employment. He chose to use his unreleased collaboration with Brian as the basis, turning it over to his protégé Jerry Riopelle to rewrite and produce a final version under the new title "Things Are Changing (For The Better)". In the end, no less than four different vocal groups recorded versions of "Things Are Changing", using the Spector-Riopelle track: The Blossoms (featuring Darlene Love), The Supremes, Jay and The Americans, and Julio Angel and Lucecita. The different versions were then broadcast in various markets throughout the U.S. (or, in the case of the Angel/Lucecita version, in Puerto Rico).